Christian Garin’s victory over Casper Ruud earn him his first tour-level title. Like father, like son. After all, tennis runs in the Ruud family. On Sunday, playing in the singles final of the Fayez & Sarofim Co. U.S. Men’s Clay Court Championship in Houston, Texas, 20-year-old Casper Ruud of Norway had the chance to do something that his father, Christian, never accomplished during his pro career: win an ATP Tour title. The elder Ruud, who coached his son throughout the ATP 250 tournament at the River Oaks Country Club, peaked at No. 39 in the world rankings and reached the final at Bastad in 1995. Yet, he never lifted an ATP Tour tour-level trophy. As it happened, Christian Garin of Chile defeated Ruud, 7-6 (4), 4-6, 6-3, for his first ATP Tour singles title and became the eighth first-time ATP Tour winner this year. Although there wouldn’t be a perfect ending for Ruud, there would be for the 73rd-ranked Garin, who became the first Chilean singles champion since Fernando Gonzalez won at Viña Del Mar 10 years ago. En route, Garin saved five matches points during his second-round win over Jeremy Chardy of France. He played match tough all week. Meanwhile, the 22-year-old Garin reached his second clay-court final of the year by defeating the tournament’s last-remaining seed, No. 8 Sam Querrey of the United States, 7-6 (2), 6-2. The two young guns – both very likable – met earlier this year during the “Golden Swing” through Brazil and Garin prevailed 6-4, 6-4 over Ruud in the semifinals of the Brasil Open in São Paulo. This time, before an enthusiastic crowd, they played like they were both ready for prime time. “It’s impressive to see how each has handled the conditions this week and maintained their composure” said Tennis Channel analyst Paul Annacone, who commented on the match. Each played offensive tennis throughout the two hour and 29 minutes they were on court and both took plenty of chances – maybe too many in Ruud’s case. Ahead 6-5, he was unable to hold a 0-30 on Garin’s serve to close out the first set. Instead, Garin won it in a tie-break 7-4. Ruud recovered in the second set and put together a strong service game to close it out 6-4 with a stretch volley winner, sending the final to a deciding third set. In the final set, Garin broke Ruud to go ahead 4-2 and at 5-3, he hit an ace to set up championship point at 40-15. Then, as he put away the title on his first match-point opportunity, Garin fell to the ground in celebrating his moment of victory. Both players received wonderful applause from the River Oaks crowd following the conclusion of the final. While it became a celebration for Garin, who will break into the Top 50 by climbing 26 spots to No. 47, Ruud showed this week he’s ready to take the next step in his budding career, too. He will move up to No. 70, which will no doubt improve his chances of making the main draw at Roland Garros next month. Unseeded Santiago Gonzalez of Mexico and Assam-Ul-Haq Qureshi of Pakistan, who a day earlier upset the top-seeded team of Bob Bryan and Mike Bryan of the United States, beat another pair of brothers in the final, No. 4 seeds Ken Skupski and Neal Skupski of Great Britain, 3-6, 6-4, 10-6 to win their first ATP doubles title together. Gonzalez and Qureshi outpointed the Skupskis 60-57 during the one hour and 24 minute match that preceded the singles final. The win was Gonzalez’s 13th ATP Tour doubles title and the 17th for Qureshi. 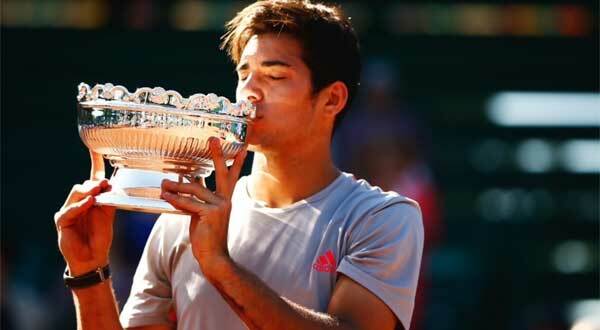 • Christian Garin became the first Chilean to win an ATP Tour clay-court tournament on American soil since Fernando Gonzalez beat Nicolas Massu in an all-Chilean final in Orlando, Florida, in 2000. • For his first tour-level title, Christian Garin earned first-prize money of $100,600 and 250 ATP Rankings points, while Casper Ruud received runner-up prize money of $54,395 and 150 ATP Rankings points. This entry was posted in ATP Tour, ATP Tour News and tagged ATP Tour, Christian Garin, Fayez Sarofim & Co. Houston Clay Court Championship, Houston.